Almost everyone has come across somebody with a big swelling on the front aspect of the neck; sometimes, the swelling is so massive that the affected person may not be able to bend the head downwards. And most of the time, people with this neck swelling seem to be less worried about it. 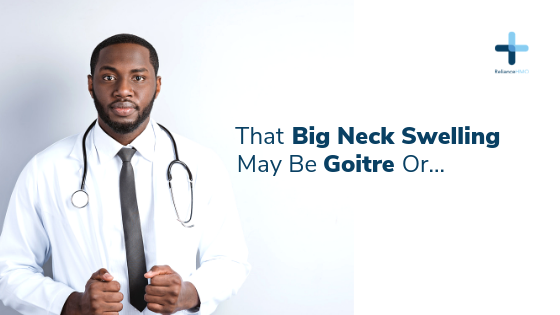 This neck swelling is called goitre. However, it is a type of goitre known as non-toxic. Goitre is a swelling of an organ, called the thyroid gland, in the front region of the neck just below the Adam’s apple. The thyroid gland produces a chemical substance called thyroxine (a hormone) which helps every single cell in the body to carry out its metabolic (energy generation and breakdown) functions. For this thyroid gland to produce thyroxine it depends on the brain to produce and secrete certain chemicals; it equally depends on the iodine we take in our food to be able to make this thyroxine. Normally, the body stores iodine from the food we eat, and the thyroid gland can work with this store for 3 months with no problem, even if no other iodine is taken throughout that period. eating food containing lots of cabbage for years. Cabbage has been shown to impair the ability of the thyroid gland to utilise iodine to make thyroxine, the chemical needed by every cell in the body. So, even if you’re taking enough iodine through your food, your thyroid gland may not be able to utilise it because of the excessive cabbage you’re consuming. some chemicals present in coal mines can also cause goitre, so people who work in such places may develop goitre if they don’t take occupational safety measures for protection. goitre can also be due to a genetic (inherited, meaning it runs in the family) inability of the thyroid gland to produce thyroid hormone, thyroxine. Because the non-toxic goitre usually has no symptoms and doesn’t cause problems in most people, many people with goitre don’t seek medical attention. However, the right thing to do by anyone is to visit the doctor once he or she notices any neck swelling. Visiting a doctor will allow him or her take a detailed medical history from the person and carry out some tests to identify the cause. This is important because that non-toxic goitre can become so large to compress the surrounding neck structures like the windpipe or oesophagus; it can turn into a malignant (cancerous) goitre; the initial swelling can even be cancer. So, seeing a doctor for a case of goitre can lead to early treatment with either medications or surgery if it turns out to be cancerous; or the doctor can advise you on taking foods fortified with iodine and follow you up periodically to monitor the neck swelling if it is a non-toxic goitre. Always cook with iodized salt. Next Post Next post: What is the commonest cause of death in Pregnancy?